Toast hazelnuts until slightly browned and cool. Crush with a mallet, just to break up to smaller pieces. For the clementines, peel and segment. In a blender combine the vinegar, honey, preserved lemon, Dijon mustard, and shallot. Blend until incorporated. On low speed, gradually drizzle the oil in to create an emulsification. Once all oil is in or the vinaigrette is at a nice thick dressing consistency, add salt and pepper to taste. Can be stored in a mason jar for up to 30 days in the refrigerator. 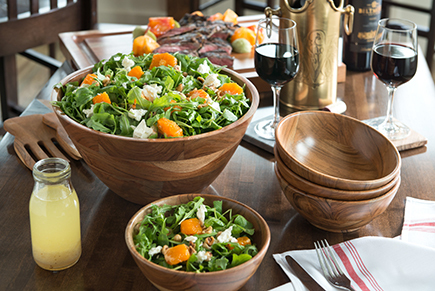 In a large mixing bowl add 3 generous handfuls of arugula and 3 tablespoons of preserved lemon vinaigrette. Dress this very lightly as not to take away from the peppery flavor of the arugula. Season with a touch of salt. Top with desired amount of crumbled feta, hazelnuts, and clementines, and serve.